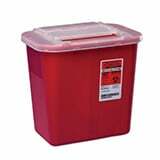 You are buying the Kendall Sharps-A-Gator 2 Gallon Sharps Container Red 20/bx, Model # 31142222. ADW Diabetes offers a complete line of syringes made by Kendall. We offer these syringes in single boxes as well as case packs for your convenience. Save with ADW Diabetes - We offer products at up to 60% off retail pricing. Kendall Sharps-A-Gator 2 Gallon Sharps Container Red 20/bx, Model# 31142222. The multipurpose sharps containers with sliding lid family of products was created to protect and ensure the safety of both healthcare professionals and patients. Large, horizontal opening accommodates larger sharps. Easy, simple assembly allows for quick assembly. Nestable containers saves valuable storage space.